Most companies with a presence on Google will have an interest in appearing at the top of search results. Naturally then as SEOs, we are often asked how featured snippets can be acquired. If you’re currently working on winning some featured snippets, this blog post will give you some tips and processes to get you started. 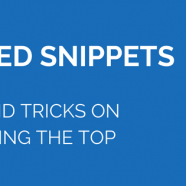 In this post I am going to share some current featured snippets stats and trends, and go through my own method on how to win them. I’ll cover the different tools I found useful, how I determine what queries to prioritise, and how I decide what changes to make to the content. Often following featured snippets are People Also Ask (PAA) boxes, which are also relevant to define for this blog post. PAAs are a set of related queries that display an answer in a format similar to a featured snippet when selected, as seen in the following image. They are also dynamic, so whenever you select one, a new one will load. These are important findings to keep in mind when you are researching featured snippet opportunities. The below image from Rob Bucci’s slide deck shows the ranking distribution of pages that are winning featured snippets. This graph includes featured snippets and People Also Ask (PAA) boxes in the rankings. The second and third positions had the most featured snippets in 2016 and 2017, respectively. The graph has shifted over by one in 2017 due to the appearance of PAA boxes. The first thing I start with on almost any research task is getting all the data I need into one place. For featured snippets, this data is a list of relevant keywords that you rank at least 10th for (ideally higher than 4), and queries that have featured snippets on the Search Engine Results Page (SERP). In this list, I also make sure to keep a note of what snippets we currently own and which ones we don’t. The main tools I use are STAT, ahrefs, and Moz’s Keyword Explorer. These are all tools you need subscriptions for, although Keyword Explorer does have a limited free version. Using these tools, create a Google Sheet or Excel document where you can keep all your data in one place. When compiling a lot of data into a document that has lots of different sheets, it’s really important to label each tab with where you got the data and what the data shows, or else you run the risk of forgetting and needing to redo work. In STAT, on the main view, there is a “SERP Features” tab, which displays data that looks something like the below. In addition to these features, STAT’s PAA reports can also be useful for generating more keyword ideas. For ahrefs, this blog post goes in-depth on how to use their platform for research on featured snippets. I find it most useful for tracking what featured snippets you do and don’t own and for working out who my competitors are. For instructions on how to use Moz’s Keyword Explorer, read this blog post from 2016. The tool can be used for both tracking what keywords have featured snippets, and also for generating new query ideas. Once you have a list of keywords that have featured snippets, and an idea of what ones you do and don’t already own, you need to whittle that list down to the most important queries. First filter down to keywords where you rank at position 4 or better, then prioritise those based on search volume. What search volume limit to choose will likely vary by client / site, but typically you can bin anything with a search volume less than 20. From what is left over consider the relative search volume. For the most part, I only keep keywords with a search volume of 100 or more. Your time is best spent on volatile snippets, so you should try to track who is winning the featured snippet for a query you may want to target across a period of time. If that changes during the time you are watching, or if the snippet disappears and reappears, that’s a good indication it presents an opportunity. Another thing to make a note of are featured snippets you don’t own, but where you rank higher than the page winning the featured snippet. The logic being that in those instances your answers (or lack thereof) are more likely causing you to lose out, rather than your ranking position. For example, in the below image both National Geographic and Thought Catalog rank higher than Smithsonian Magazine, the featured snippet owner. Within your spreadsheet, create separate pivot tables for both your owned and unowned snippets, with the landing page as your rows and the number of keywords that landing page ranks for as your values. These will tell you if you have pages that appear in the SERPs for a lot of different keywords. Improvements to those pages could have a bigger potential payoff, and therefore may be worth prioritising. On the flipside, it can also indicate landing pages that are already doing well and thus are better left untouched – especially if they own non-volatile snippets. It’s all well and good to have all that data, but the main reason you are here is that you want to steal featured snippets. Because featured snippets that are static often remain static, your attention is best focused on those that are more volatile because it means Google hasn’t made up its mind yet on who to feature. When doing this work, you will begin to find yourself doing what feels like competitor research, as current featured snippet owners are your best resource for discovering what Google likes. Once you know what keywords you want to focus on, begin to dig into who currently owns the featured snippets, and often you will find that many of these were winning multiple of the keywords you are targeting. When you have an idea of the pages you are competing with, compare these pages with your own to try and see if you can find any obvious differences. If you’re ranking well and you don’t have content on your page that answers the specific query, adding in content to answer that query and modelling it off of your competitors is a good place to start. If you’re in a situation where you already have that content on your page, but you still aren’t winning the featured snippet, then differences to look out for between you and your competitors are the format of the answers, the headings, and the general informativeness of your answers. As I noted above, if you find yourself with a lot of “how to” or “best” queries that you’re focusing on, changing your formatting into lists if they’re not already can be an easy win, as shown in this 2016 blog post from Builtvisible. You may find that the format you are using and your competitors are using are the same. In these instances, try stealing things like the headings that your competitors are using to lead the featured snippet content with, or other small differences in wording. The last thing to try and consider is whether the content in the featured snippet owned by a competitor gives a more informative answer than yours. Does it better answer the query? Are our answers more commercial than informative? That sort of thing. Remember that Google above all else wants to provide the most informative answer for its users, so the more closely your featured snippet content aligns with Google’s agenda, the better. If you are working with a large website that has a lot of unique landing pages ranking making it too gruelling to look at these on a case by case basis, I’d recommend prioritising twenty to examine. If within that sample you find there are a lot of instances of commercial or salsey content, more likely than not this will be the case across the site. Winning featured snippets can be finicky and involves a fair bit of trial and error. I have found though that with featured snippets little changes really make a big difference. The changes that work for me are more often changing headings or changing formatting rather than changing the content. As with most of SEO, there’s no one size fits all approach on how to win a featured snippet, but hopefully this blog post helped to steer you in the right direction. Alternatively, if you have other methods you’ve successfully used, I’d love to hear them – feel free to comment below.